It's tough to tell at first glance, but no, that's not Beyonce. That's The Late Late Show host James Corden dressed as a cheerleader. As part of his preparation for Sunday's Emmys, he dressed up as a Los Angeles Rams cheerleader for the team's first home game since moving back to Los Angeles. He joined the cheer team during a time out to dance to Tone Loc's "Wild Thing" and it was really... something. An awkward, amazing, hilarious something. Corden and The Late Late Show already won two Emmys this year, including one for Interactive Program and a Variety Special for their Carpool Karaoke primetime special. Sunday night, he's up for the big one for a talk show: Best Variety Talk Series. The "Carpool Karaoke" host is competing against Jerry Seinfeld's Comedians in Cars Getting Coffee, Jimmy Kimmel Live!, Last Week Tonight With John Oliver, Real Time With Bill Maher, and The Tonight Show Starring Jimmy Fallon. 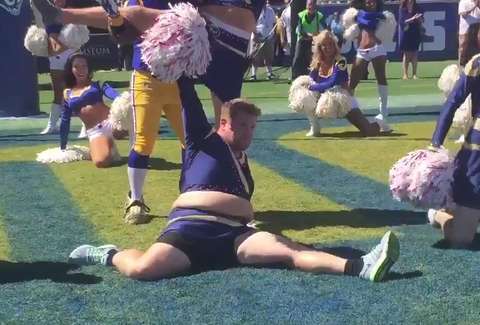 Watch Corden bust a move with Rams cheerleaders above. It was definitely the best moment of the Rams' first home game in 7,987 days. They won Sunday's game, but two weeks into the season and they have yet to score a touchdown.